Matthew Apgar - mapgar@shawmedia.com Beth Gardner of Crystal Lake, center, applies makeup to Lilah Stoner, right, as Amelia Stoner, left, watches in the makeup room during rehearsal for the play "The Ash Girl" on Wednesday, Oct. 14, 2015 at Crystal Lake South High School in Crystal Lake. The play will be held at 7pm at the school on Oct. 15-17. Matthew Apgar - mapgar@shawmedia.com Olivia Perovic watches actors perform on stage as she awaits her cue for the part of spider during a rehearsal for the play "The Ash Girl" on Wednesday, Oct. 14, 2015 at Crystal Lake South High School in Crystal Lake. The play will be held at 7pm at the school on Oct. 15-17. 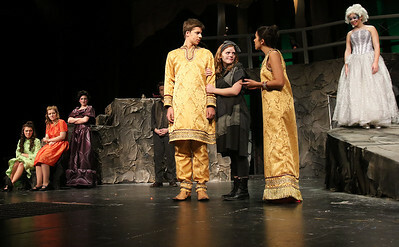 Matthew Apgar - mapgar@shawmedia.com Scout Mennenoh, playing the role of Ashgirl, center, transforms her garb from rags into an elegant dress with the help of actors playing the roles of spiders during a rehearsal for their upcoming performance of "The Ash Girl" on Wednesday, Oct. 14, 2015 at Crystal Lake South High School in Crystal Lake. The play will be held at 7pm at the school on Oct. 15-17. 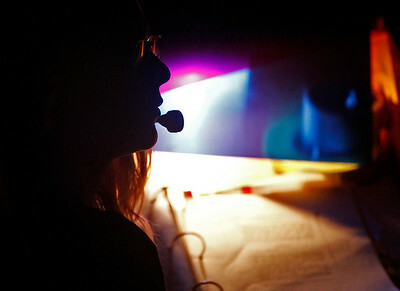 Matthew Apgar - mapgar@shawmedia.com Assistant stage manager Juniper Beatty is silhouetted backstage with a script as she monitors actors' cues during a rehearsal of the play "The Ash Girl" on Wednesday, Oct. 14, 2015 at Crystal Lake South High School in Crystal Lake. The play will be held at 7pm at the school on Oct. 15-17. 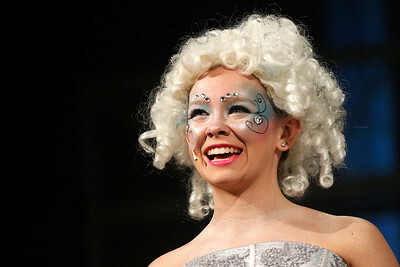 Matthew Apgar - mapgar@shawmedia.com Annie Wuest rehearses her role as Fairy In Mirror in their upcoming performance of "The Ash Girl" on Wednesday, Oct. 14, 2015 at Crystal Lake South High School in Crystal Lake. The play will be held at 7pm at the school on Oct. 15-17. 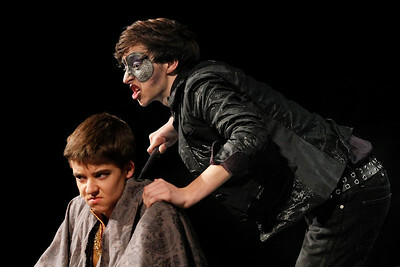 Matthew Apgar - mapgar@shawmedia.com John Janezic, portraying Amir, left, and John Martinez, portraying Pridefly, top, rehearse their roles for their upcoming performance of "The Ash Girl" on Wednesday, Oct. 14, 2015 at Crystal Lake South High School in Crystal Lake. The play will be held at 7pm at the school on Oct. 15-17. 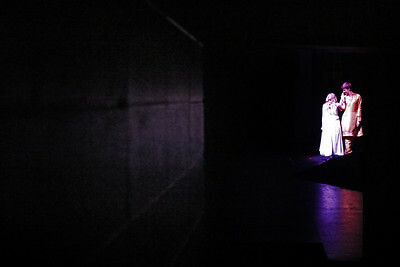 Matthew Apgar - mapgar@shawmedia.com Crystal Lake South students rehearse for their upcoming performance of "The Ash Girl" on Wednesday, Oct. 14, 2015 at Crystal Lake South High School in Crystal Lake. The play will be held at 7pm at the school on Oct. 15-17. Matthew Apgar - mapgar@shawmedia.com John Janezic, playing the role of Amir, dances with Scout Mennenoh, playing the role of Ashgirl, during rehearsal for the play "The Ash Girl" on Wednesday, Oct. 14, 2015 at Crystal Lake South High School in Crystal Lake. The play will be held at 7pm at the school on Oct. 15-17. 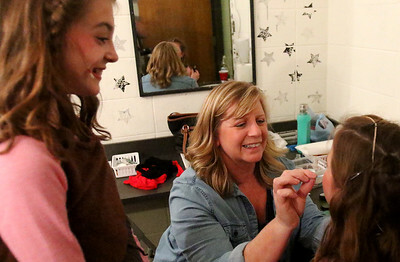 Beth Gardner of Crystal Lake, center, applies makeup to Lilah Stoner, right, as Amelia Stoner, left, watches in the makeup room during rehearsal for the play "The Ash Girl" on Wednesday, Oct. 14, 2015 at Crystal Lake South High School in Crystal Lake. The play will be held at 7pm at the school on Oct. 15-17.